As you may recall, Shellter took home the prize for Best Feature at our 3rd Phoenix Fear Film Festival, and was recently named Best Film of 2010 when we listed such things. I’m pleased to report that director Dan Donley has sent us some copies of the film to give away, so if you haven’t seen this excellent piece of horror, now would be a good chance to pick up the DVD. It’s now available from Indieflix.com and Amazon.com, with the DVD also including a bunch of extras – behind-the-scenes footage, interviews, outtakes, deleted scenes and trailers. This is why one of the DVDs Dan sent will be staying in TC Towers, replacing the screening copy from the festival. But we’re ready to send the others out to deserving homes. What scientist was responsible for the experiments re-enacted in the film? If it weren’t for the expected heady delights of Zach Snyder’s Sucker Punch, it would be quite feasible to imagine a 2011 where I don’t bother going to the movies. We all but abandoned that this year, the previous issues of increasing cost, decreasing quality of cinematic experience and the rise of alternatives, all combining to work against it. With a broad seam of “treasures” from previous years waiting to mined from sites like Cinemageddon, why bother with new movies? The does make the creation of a list like this difficult, since the number of films which qualified as “2010” was probably an all-time low, even with a deliberately-vague rule on what counts. Next year “of” may be be replaced by “watched in”. The split of how the ten were obtained is interesting. One was seen at the cinema; two were DVD screeners; two were part of our film festival; and the other five were… Well, for legal reasons, let’s just go with “not”, shall we, and I won’t say which was which. As an aside, I note that the most-pirated movie of 2010 was Avatar…which was also the most-bought DVD of 2010, with sales numbers basically the same as the most-bought DVD of 2009. And, even if you reckon every single one of those downloads personally cost Jim Cameron $10, the total amount lost was less than 6% of the film’s worldwide gross. Yeah, piracy really is bankrupting the movie-industry, isn’t it? </rant> And with that, let’s move on, shall we? Here’s the list of my ten favorites from the year just past. Links go to the appropriate review: titles marked with a * are over on GirlsWithGuns.org, so those reviews will pop open in a new window. The revival of Dr. Who by the BBC, beginning in 2005, has been one of the most spectacular successes of recent years. It resurrected a series which had, for all practical purposes, been dead and buried since 1989 – the previous reboot, in 1996 with Paul McGann, having been a one-shot TV movie flop. But McGann wasn’t the only person to play the Doctor outside the well-known regulars from the series. Indeed, if you add in Comic Relief spoof, The Curse of Fatal Death, and the list includes Richard E. Grant, Joanna Lumley, Rowan Atkinson and Hugh Grant – all of whom would have been interesting choices as the permanent incumbent. 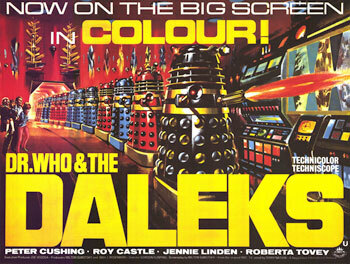 Back in the 1960’s, Peter Cushing played the Doctor in two spin-off movies. The potential here was huge: after all, Cushing had already become the canonical Baron Frankenstein and Van Helsing, as well as, arguably, Winston Smith and Sherlock Holmes. The concept of him playing a stern, Frankenstein-styled Doctor appealed enormously. Unfortunately, that’s not what we got: rather, the words “disastrous misfire” come to mind, particularly for the first movie. I can’t categorically state this is not due to my expectations having been radically revamped by the new series. Much as I loved Tom Baker growing up, I haven’t dared watch any of the earlier series since we fell in love with the reboot – it could be a disaster, in line with the re-viewing of Blake’s 7, which only succeeded in shattering forever, my fondly-held teenage illusion that it was a good programme. Certainly, it seems likely the sixties Who was aimed more directly at kids, not the general audience for the new version. But even so… Sheesh, this is pretty bad.